The LR-60P includes UHMW rollers that make this an incredibly portable and versatile low-rise pad lift. It has all the same great features as the LR-60, including multiple safety locks, rubber lifting blocks, dropped crossbar and heavy-duty steel channel frame. High-density UHMW rollers make the LR-60P a conveniently portable low-rise lift. If you’re regularly shifting car ​hoists to different service bays or have limited space you need to diversify, a portable hoist will make your garage operations that much easier. These amazingly durable wheels, and they're practically indestructible. One person can easily move the LR-60P around shops or garages, and the wheels should never wear or need replacing. The LR-60P offers portability without adding bulk. The ​hoist collapses to just 102 mm high, so low-stance vehicles have no problem clearing the frame. This small-footprint model is not only ideal for tight spaces, but for garages with limited equipment that need to work in different places around the shop, or simply store the hoist out of the way. With the push of a button on the control panel, dual locks release on each frame of the LR-60P. The control panel keeps operators at a safe distance during descent, ensuring efficiency, peace-of-mind and a safe, smooth-running hoist at all times. A dropped crossbar makes it easier to drive up and onto the frames. The center portion of each frame rises to engage the vehicle's OEM jacking points. Since the crossbar improves stability without slowing or hindering operations, Wheel service and suspension work become a cinch. A steel channel runs along the base of the LR-60P. The added stability makes this an ideal hoist for busy, active bays. With a five-year standard warranty and superior engineering put into the design, we guarantee you'll work without worry for as long as you own your BendPak. Integrated into the single hydraulic cylinder is a one-piece, pilot fitted, machined steel piston that is wrapped with specially designed, pressure loaded U-cup piston seals, backups and wear bands that virtually eliminate any fluid bypass. 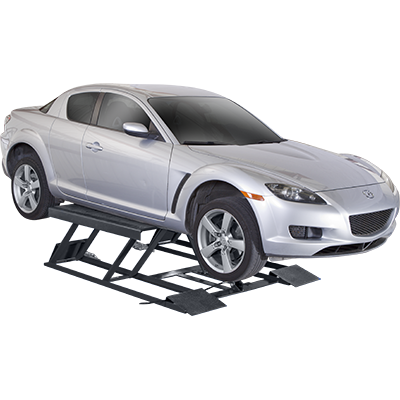 This portable low-rise pad lift includes a set of durable hard-rubber blocks. They take all the use and abuse you can throw at them for years of maintenance-free lifting. We don't even bother with or offer those thin, flimsy pads that damage your customers' vehicles or get torn to shreds after a few uses.